The month of April is without a doubt one of the favored months of the year for the majority of our nations' turkey hunters. In the South, the dogwoods bloom and the grass turns green, and for the most part, the turkeys gobble. This year, it seems as if everyone the Wild Turkey Report staff talks to, whether they are in Georgia or Texas, mentions the phrase "late spring." In west Alabama, it appears as if our spring has been about two weeks behind schedule, which has certainly had a silver lining in that our hunting has been steady from our March 15 opener until the present day. Rain has been an issue for most southern states as heavy thunderstorm systems have moved through in the first of April, making hunting tough on those mornings. However, you cannot kill gobblers from the bed, so we stuck with it. 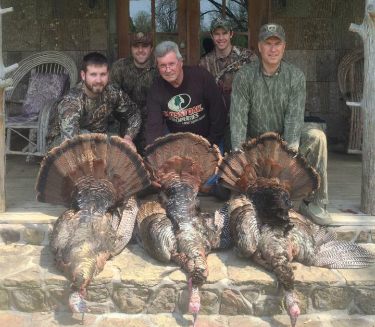 The week of April 8 was an especially good week, as numerous turkeys in our area were killed and gobbling was steady. Hens had began nesting and some lonely gobblers met their demise. Several trends we noticed here were larger than normal (for the time of the season) groups of gobblers together. For example, during the week of the 8th we had three consecutive mornings in which groups of five, four, and four gobblers were all called into gun range. This is usually something you would expect to see during the first week of the season, not the fourth. However, the late spring has changed the status quo, which has really been a positive. Elsewhere, reports of excellent hunting were coming in from Tennessee and Mississippi. Hunters near Nashville and Chattanooga said Volunteer gobblers were gobbling well and responding to calls. Mississippi, the sister state of Alabama, mirrored what we saw in early April. Hunters in Kentucky said turkeys gobbled well on their youth season and it appears a strong season is in store for the Bluegrass State. We have also had numerous posts of pics on our Facebook page from Virginia's early season hunters having success. So overall, despite the late spring and henned up gobblers, it appears early April was good in the states that were open during that time period. Strong hatches in 2011 have given many states (with the exception of Texas, whose drought in 2010 and 2011 hurt the longbeard crop for this season, although next year will be insane there given the number of jakes this year) a strong crop of vocal and eager two year old turkeys. And we have long held the opinion that a season is only as good as the number of two year olds. Moving forward, we feel that Alabama will be better than normal through the end of the season, which closes on April 30. Normally, our hunting fades after April 10 until the second peak of gobbling the last few days of April. A cooling spell due this weekend should rejuvenate the birds. There are still good numbers of longbeards around. As you move north, we expect states like Kentucky and Ohio will be very good (weather permitting) as those states should hit the peak just right. Good luck everyone, and please keep us posted on how you fare!